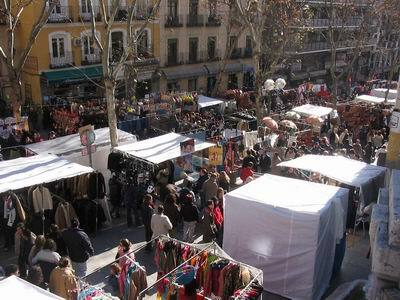 Madrid's largest open air flea market, "El Rastro" is held from 9am to 3pm in the historic centre of Madrid every Sunday, and also on public holidays, attracting as many locals as tourists, and offering a variety of products both new and old. It is said that the name derives from the fact that cattle from Madrid's abattoir were transported to nearby tanneries located in Ribera de Curtidores street and left a trail ("rastro" in Spanish) of blood on the streets. Said to be the largest flea market in Europe with up to 3500 different stalls, it extends through several streets in one of the city's oldest working-class neighborhoods. Established in the Middle Ages, its hub is the Plaza de Cascorro (featuring a statue of legendary soldier Eloy Gonzalo) and sprawls downhill towards the river. The main street is Calle Ribera de Curtidores, formerly the site of the city's tanning industry. There are bargains in everything from furniture to clothing, together with souvenirs and a wide range of other goods. Antique shops also line the surrounding streets and remain open on Sundays to take advantage of the market's lively crowds and wonderful atmosphere. If you're in the city between 9am and 3pm on Sundays or public holidays, this is an experience not to be missed (although you should look out for your belongings, as this is a place notorious for pickpockets). When the stalls close in mid-afternoon, join the crowds in the surrounding bars for some tapas and beer. 'EL RASTRO' from DRAKKAR (www.drakkarhd.com) on Vimeo.